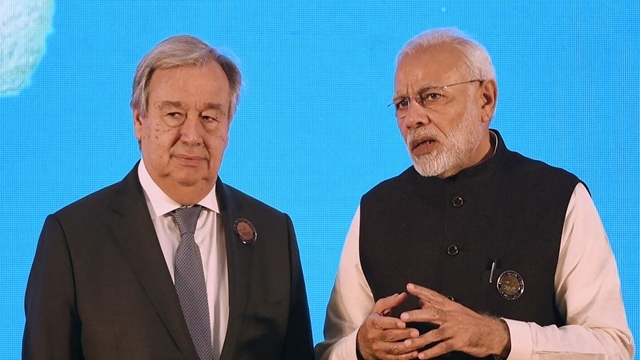 Making a strong pitch for making those involved in violence against Rohingyas accountable, United Nations Secretary General Antonio Guterres urged India to put pressure on Myanmar and support Bangladesh. "What can India do? Support Bangladesh in helping these people because there is a huge humanitarian problem. Second, to put pressure on Myanmar, the military in Myanmar for reconciliation and create conditions for these people to go back. These people will not go back in present circumstances," the UN chief said. He also said that to keep Rohingyas in such a "discriminatory situation" is "an invitation for terrorist groups" to exploit the situation. "I have never seen a community so discriminated in the world as Rohingyas," Guterres, who arrived in India on Monday on his maiden visit to India, said in response to a question on the issue after delivering a lecture on 'Global Challenges, Global Solutions' on Tuesday night, reports our correspondent in New Delhi. “There should be accountability to those crimes," he said on the treatment meted out to Rohingyas and added "to keep a population in such a discriminatory situation is an invitation for terrorist groups" to exploit the situation. During a question-answer session after his lecture, the UN Secretary General said Rohingyas do not have access to health and education and there was a deep-rooted feeling of racism against them in the Myanmarese society. As an example of this racism, Guterres recalled his visit to Myanmar as the High Commissioner for Refugees, and said that at that time the president of Myanmar had asked him to resettle Rohingyas in some other countries. "To make them refugees is not my role. My role is to solve the problem of refugees. This shows how deeply-rooted is the negative perception of the Rohingyas. This was intensified by some hate speech by some monks on social media. There are over one million people in Bangladesh. They were people burnt, raped,” he said. Guterres said "even if there was a provocation, the reaction of the armed forces was brutal." He emphasized on political reconciliation so that the Rohingyas could be repatriated to their country. During her visit to Myanmar in May this year, Indian External Affairs Minister Sushma Swaraj had offered to help in safe, speedy and sustainable return of Rohingyas. India has also been helping Bangladesh in providing humanitarian assistance to Rohingyas.